‘Mongaljori Ghera’ is a refuge of the waterfowl, which attracts a number of winter migrants. Monglajori, acknowledged as an IBA, supports around 200,000 – 300,000 waterfowls during the winter along with populations of around 15 other species, surpassing 1% of their bio-geographical population. The population includes Red-crested Pochard, Tufted Duck, Fulvous Whistling-duck, Asian Openbill, Purple Swamphen, Grey-headed Lapwing and Cotton Pygmy-goose. Some other species found in considerable numbers are Northern Shoveler, Northern Pintail, Black-tailed Godwit, Ruddy Shelduck, Garganey, Clamorous Reed Warbler, Eurasian Wigeon and other resident birds. Raptors include Brahminy Kite, Eurasian Marsh Harrier and White-bellied Sea Eagle. Whiskered Tern is also found in plenty in the season. Few years back, hunters were very active at Monglajodi, who used to travel around this wetland with loaded guns in search of migratory birds. However, lately, bird poaching is not practiced anymore. Places to see in Monglajori: Monglajori is an extensive wetland spanning an area over 300 sq. kms. The area is a safe haven of around 236 species of birds, among which, most are migratory. The tourists are truly thrilled by watching various species of birds, which include Northern Shoveller, Pintail, Brahminy Duck, Bar headed goose and others. Moreover, the tourists can also closely observe the nesting, breeding of some regional wetland birds like Open billed stork, Purple moorhen etc during the rainy season. Another major tourist attraction of the site is an age-old and largest temple of the village, popularly known as the Patita Paban Temple. The village also houses some other notable temples like, Gupteswar Temple, Maa Mangala Temple, Nilakathaswara Dev Temple and Maa Balimajhi Devi Temple. There is also a picnic spot surrounding Maa Balimajhi Devi Temple. Nearby attractions of Monglajori: The nearby prime spots of tourist interest are the Chilka Lake and Nalabana Bird Sanctuary. 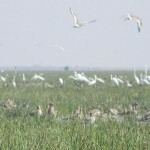 Chilka Lake is a salt water estuarine lagoon, which is the haven of seven to eight lakh birds, comprised of 121 species. Things to do at Monglajodi: Monglajodi is the heaven for the avid bird watchers. How to reach Monglajori: Balugaon is the closest rail station of Monglajori, which is accessible via Tangi by roadway. Beat time to visit Monglajori: The ideal time for visiting Monglajori are the months between November and March. This is the best time for bird watching in Monglajori. Lodging and dining facilities at Monglajori: An eco-tourism camp is operated by private organizations in Monglajori. However, better lodging facilities are available at Balugaon, Kalupada and Khurda Road. I am an amateur bird watcher. I was in Monglajodi in 2010. The locals were very helpful. We hired a boat for a 4 hours trip for 650 rupees. These boats are operated by local fishermen only. Monglajodi is just 35 kms from Balugaon – you would get Auto Rickshaws and trekkers at Balugaon to take you to Monglajodi. But there is no accommodation at Monglajodi – the villagers do offer homestays but we did not stay there, we stayed at Balugaon. There is another route to Monglajodi, that is via Barkul, which is around 40 kms from Monglajodi. Tourists can also stay at Barkul. We went to Vetnai/Monglajori just a week back. Mr. N.K.Bhujabal was excellent. Thanks to you for providing me with his phone number. It was superb. We thoroughly enjoyed it, and would like to return some other time. A good decent accommodation there is what is now needed, and may be a little more publicity. There were not many tourists there. And they were generally well behaved.